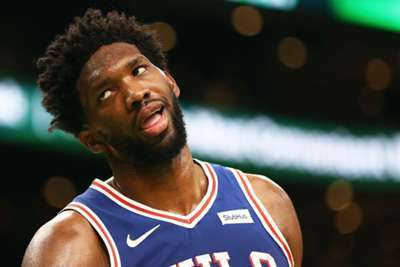 Joel Embiid does not think the Philadelphia 76ers can be considered rivals with the Boston Celtics because "they're always kicking our a**". The 76ers began 2018-19 with a 105-87 loss to the Celtics, who eliminated them in the Eastern Conference semi-finals last season. Following their victory at TD Garden, Boston have lost just three of their last 23 meetings with Philadelphia. Embiid top-scored for the Sixers on Tuesday with 23 points and he also grabbed 10 rebounds for a double-double, but he could not hide his frustration at losing to the Celtics. "This is not a rivalry. I don't know our record against them, but it's pretty bad. They're always kicking our a**," said Embiid. "This is not a rivalry and we mentioned that earlier. We've just got to work together and figure it out earlier." Embiid and Celtics forward Jayson Tatum work with trainer Drew Hanlen and worked out together during the offseason. Asked about going up against someone he is close with, Embiid said: "Jayson, like I said, is special. I was with him all summer, a lot of one-on-ones, even though I was kicking his a**. "I love him, I love his game and I'm excited to play against him for a long time." Ben Simmons (19 points, 15 rebounds, eight assists) felt Philadelphia could be pleased with their opening match despite defeat. "I think it was a good start for us," said Simmons. "It just takes time. You've got to knock the rust off. "I think a lot of it is communication, we've just got to talk a lot more. That's the main thing."